It seems as most homebrewers I have meet always have a nemesis beer. A beer that always seems to have a monkey wrench thrown in every time you brew it and it never comes out the way you want it. For the longest time IPA’s were my nemisis. I like my IPA’s to by extremely fragrant, decent hop flavor and very malty. I took me a long time to figure this combination out. I think my latest IPA, a black IPA with Nelson Sauvin hops has finally got me over the edge of that beast. However my newest nemesis is the English Pale Ale. I can’t get the yeast right on this beer. I continue to get this pear ester that is driving me nuts. Each time I keep dropping the temp of fermentation to avoid it. I’m getting closer, but I’m still not satisfied with this style. What is or have been your nemesis beers and what are you doing to tame the beast? Anything from the Scottish & Irish Ale category turns to crap for me. I can nail sours and lagers, but my shilling ales are terrible. It is embarrassing and humbling. Saison. What should be an easy brew always gives me a headache when it comes to fermentation. I nearly swore off the Dupont strain until I went all grain and started using starters. 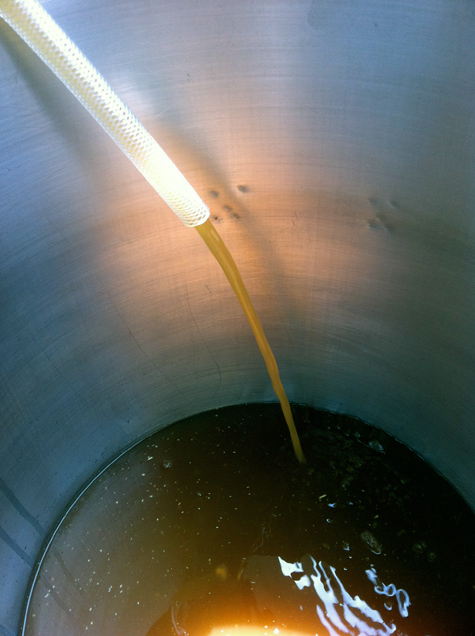 Managing temp and brewing with the seasons to help ambient temperatures has helped. PAs are easy to brew but almost impossible to brew well. You can go through endless combinations of hops/malt/yeast. The perfect pale ale has been my nemesis so far. German wheat beers are also tough to get right as far as the yeast profile goes for me. Wow Jamie, i thought a homebrewing god such as your self would have the scotch ales dialed in! 🙂 Seriously, it seems as though every one has some beer that just doesn’t sit right with them. Jmooy, the saison yeast is a fickle creature. I’ve found a sharp increase in temp after a couple of days of solid/active fermentation does the yeast pretty well. Rob, I hear ya. While the wheat beers are not an issue for me, the darn PA continue to taunt me! I haven’t really been able to nail down a wheat beer. I’ve tried a dunkel, a Blue Moon clone with oats, and most recently a Bavarian style hefe. The Hefe was the best but it still wasn’t quite right. I also feel like the more IPAs I make the worse I am getting at them, but trying to be an optimist because I have 2 in the pipe right now. Jason, what has been your issue with the wheat beer? Off flavors or body? IPA’s are getting harder to do with every brewery having some type of hop monster. You start comparing you beer to those and there are a lot of small nuances to the beer that make similar ones are difficult. Good luck with the IPA’s, let me know how they turn out. To be honest, I think the issues with the wheat beers were all separate issues, it’s just annoying that it’s always my wheats. My Dunkel just tasted astringent and crappy (it was my first homebrew and I used the awful T-58 yeast), the Blue Moon clone was in the midst of a chlorine flavored water crisis I’ve since solved, and the Bavarian just had little issues….not enough banana and clove, too much spicy flavor from my on the fly addition of some coriander. I second Jamey’s pick for Scottish Ales. Mine always tastes like muddy water. I’m letting this latest batch age for a long time, hoping for a miracle. Billy, I just entered my Wee Heavy in the Dominion Cup, can’t wait to get my results back. I’m super happy with it. It is one style I’ve always brewed well. Good luck and keep us posted on the results. I need to look over your shoulder next time you make one of these. I hear that Jorge! It took me a long time to start dialing in on that flavor. I can never seem to get IPA correct. I’m not sure if it’s my city’s water supply or if I’m getting recurring infections, but my IPA’s always come out tasting like damp band-aids and plastic. Maybe my hop supplier isn’t storing them correctly? Matt, unfortunatly Bandaids sound like an infection. Is this common with the beers you dry hop? Yes, I’ve gotten this off-flavor several times when dryhopping. I’ve always been told that you can just toss hops into wort or fermented beer without having to worry about infection (since hops themselves have preservative qualities), but it just doesn’t seem right to me. I think it’s time to try a different hop supplier or rethink my sanitation process. I’m looking forward to winter, so I can finally hammer out a decent Oatmeal Stout. My previous attempts have been either too roasty or not roasty enough, too thin, etc. still trying to figure out the roasted malt balancing act.